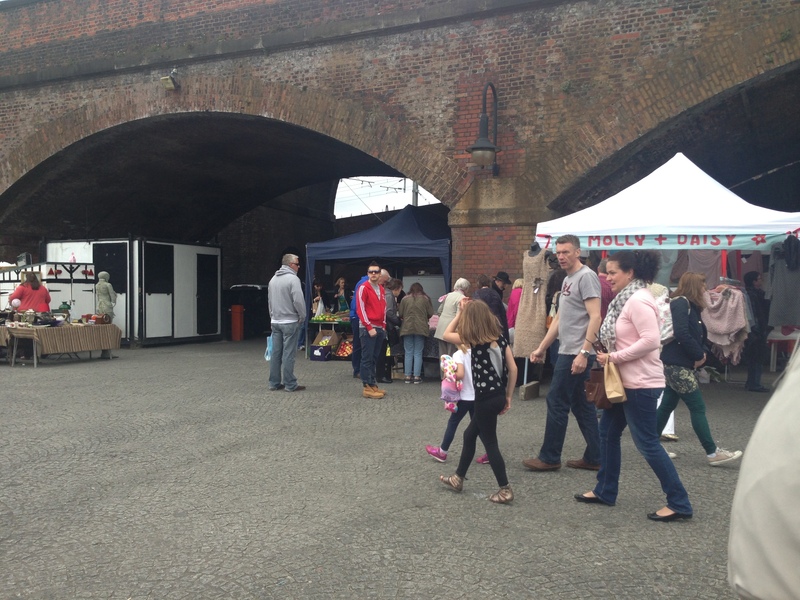 Normally the Duke Street car park, this blank canvas transforms now every Sunday (formerly the first Sunday of every month), into Castlefield's artisan vintage arts and craft market. This isn't any old market though, it's the best I've been to in Manchester not just because of the quality of crafts on offer, but the food stalls are excellent and there's one thing that sets it apart from all the others: the music. You'll hear it before you see it. Blasting out swing music, and all the classics you can 'do the bop' to, are the The Cotton Town Hot Club who play vintage records. Dancing begins at 12pm and members of the public are encouraged to join in - bring your dancing shoes and dance to your heart's content with the professionals. Don't worry, everyone's a beginner, but everyone just gets stuck in, and the joy on all faces is really a pleasure to see. If you're happier tapping your foot then cool – the pro's will be swinging around and showing you how it's done. The food on offer is the best I've seen in Manchester. This artisan market prides itself on providing the finest purveyors of quality, local foods because it's one of their stall-holding stipulations. In my opinion it's not the fact that all stall-holders use local ingredients that makes this one of the best markets, it's the variety of food. Unlike many markets, which are full of 'rare' pork sausages, or local cheese stalls,Castlefield's Artisan Market is a true mish-mash of cool food stuffs (hot and cold) made by local people. There are 'try before you buy' nibbles at every single stand, which is brilliant. What really took my fancy were Tupperware boxes full (to the brim) of a lentil curry made by the talented chef inside the stall who was whipping up hot roti to dip into the warmed lentil curry. Creamy, slightly sweet and not spicy in the slightest (just how I like it), it was a vegetarian/curry lover's/foodist's dream. At £4 a box it was lunch and dinner for one. If you're into drinking then try the local ale. Scratch that, even if you're not 'into' it you should try it - the couple behind the drinks are a jolly pair too, who'll tell you where each ale comes from. We met some local Lancashire cooks who sell home-made spices like ras-el-hanout, sumac, and dips like babba ganoush, chick pea hummus. Inspired by their travels, these two cooks were showing off their cooking skills with an array of middle-east inspired flavours. There's also a fresh fruit and vegetable stall with locally grown produce. Grab fresh carrots for Sunday lunch, and apples for dessert. Prices vary per stall, but I found that the food on offer was marginally cheaper than at some of the larger festivals and markets I've visited recently. 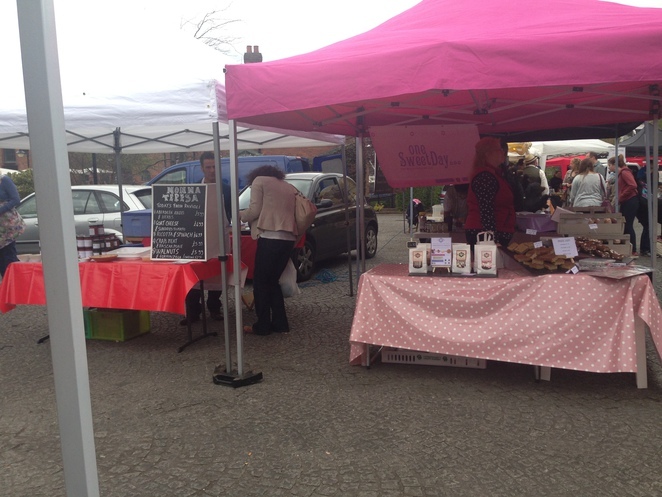 Some cakes started from £1 for example and savoury condiments were £1.50 (for generous sizes too). I recommend it because there's an infectiously lively, fun atmosphere; kids, dogs, grown-ups, OAP's are all welcome. Grandmas and Grandads will love the music if they're blues and swing lovers. Your parents might be fans too (mine are), so it really is a great day out for all. Even surly teenagers will be wooed by the unusual art and crafts on offer. With plenty to keep kids entertained, plenty of seats in front of the music area, (in front of the hot beverage stand), and plenty of savoury options for lunch, that's your Sunday sorted. With the British weather finally looking like spring, the Castlefield market is the perfect Sunday outing.